Rebuilding your mouth and charming smile in a short dental holiday to Thailand requires special planning. Before,if you lost a tooth or a few teeth your only choice was to get false teeth aka dentures. Now however, there are much better options in Bangkok and Phuket such as Zygomatic dental implants. One requirement however for having dental implants or Mini-Dental Implants is having good existing bone structure on the upper jaw. If you have lost a significant amount of bone mass on your upper jaw, you will be advised to also have bone grafting surgery. In this procedure, bone mass will be rebuild to serve as a foundation for your new implants. In addition, you may also be required to have a sinus lift before traditional implants can be placed.This time requirement makes coming to Thailand difficult for many visitors around the world. Luckily, there is a revolutionary new procedure now offered exclusively at the dental center of Thailand. Our safe techniques are designed to be accomplished in a short dental vacation. Patients from abroad with poor existing upper jaw bone mass to get implants without bone grafting surgery or sinus lift surgery. This specialized dental procedure is known as Zygomatic implant. In this dental procedure the implants are fixed on the zygomatic arch or cheekbones where there is usually enough bone to support dental implants and the bridge. The entire smile makeover process using Zygomatic is much faster than traditional dental implants and is also ideal for those with poor upper jaw bone mass. Before your dental procedure in Bangkok, you will have to undergo light dental exam with photographs, CT scans, x-rays and dental impression to determine your upper jaw structure and the amount of bone available to use. This will also guide our Thai dentists in the proper placement of the dental implants. An anatomical model of the patient’s jaw may be constructed as well. Nobel Biocare Zygomatic implants usually make use of two extended dental implants that can measure up to 55mm long. This will be screwed on your zygomatic arch. Then, two to four ordinary implants are embedded on the upper jaw bone. During the entire process, you will be placed under general/twilight anesthesia. Once the implants are anchored on the upper jaw bone and the cheek bone, a prosthesis is attached. This procedure is less invasive than other oral surgeries and can be performed without the need for extended hospital stay. When compared to bone grafting, zygomatic implants have much less complications and higher success rates. They are also faster for recovery and the actual treatment time is also much shorter. 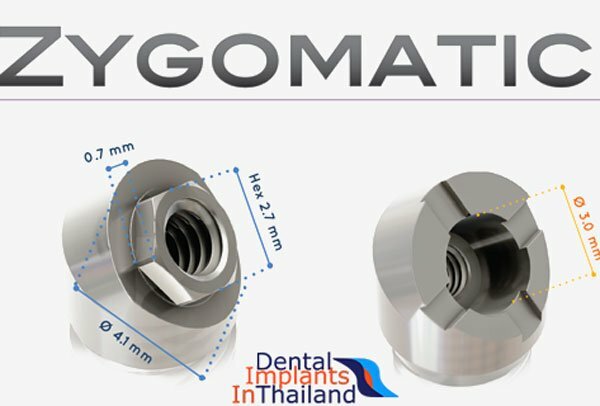 The advantage of zygomatic dental implants are that they remove the need for bone grafting and sinus lifts and call accomplish the results in just a single visit to Thailand. Before you undergo zygomatic implant procedure in Bangkok, it’s important that you choose your dentist wisely. DIT recommends only with legitimate and highly qualified dental professionals in Bangkok. If you are unsure about the reputation or quality of a specific dentist in Bangkok or Phuket, please contact us. We can help you find a internationally accredited dental clinics with native english speaking dentists that performs all-on-4 and zygomatic dental implant procedure. Since this is a specialized dental procedure it is important that you choose the right dental surgeons and/or periodontists, to avoid problems any issues in the long run. The cost of Zygomatic dental implants in Thailand starts at only 40,000 THB. To get actual and fixed prices or to qualify for multi-area discounts, our dentists will need to understand your current dental needs by reviewing a recent dental xrays or photographs or report from you dentist at home. This virtual consultation only takes a few days and will provide you with a very accurate no-hassle price for your dental holiday. Good oral care and hygiene is essential after placement of Zygomatic implants. This preparation is essential to help avoid infections and other complications. Debris can be washed and rinsed under the bridge by good brushing and use of an oral irrigator. It is also advisable to visit your dentist back home at least once a year to have your implants cleaned and checked. To learn more about Zygoma Implants in Thailand or other dental treatments we offer please contact us today.